I know Kristin is excited to see these, but not as excited as I am to share them, so I'll just get right down to it!!! Sweet little Colette just celebrated her 1st Birthday!!!! What a little peanut she is! (Hasn't she grown so much since the fall?? 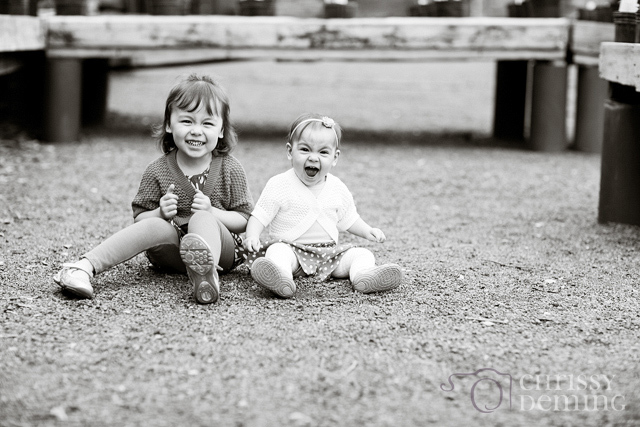 Her sister Maddy joined her for the session and brought along her sweetness and crazy faces! If you can look at this picture without thinking "Oh my gosh, what a sweetie!!!" you have a heart of stone. STONE! I looooooove this next one! I asked Maddy to hold Colette's hand, which she did as seen on the left. Colette, who I'll remind you is 1, didn't want to do that and took her hand and walked away. Maddy's expression is priceless!! I'd be lying if I said I didn't laugh a little when I saw her sweet face while I was editing. Poor kiddo!! Thanks for a fun time, girlies!!!!! !